This selection of the species comes from the type location. It generally has shorter leaves than other selections, and tends to have more wiry stems. 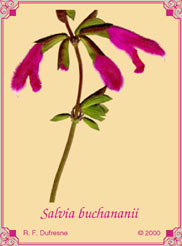 The flower size is in the mid-range of known varieties. It is perhaps a bit more hardy than the others. The hairs on the leaf margin that give this plant its specific name are more prominent. It is perhaps more xeric than the other forms collected. The main reason it is not readily available is that it is more difficult to propagate than other selections. The forms Diablo and Painted Ladies are gaining in popularity for this reason. If anyone wants a good sage as a container plant, this species is it. Besides tolerant of being potbound, it forms a multitude of stems (about a dozen per square inch). The stems bear attractive glossy foliage that is actually smaller than the flowers. The latter are a rich fuchsia and hairy. 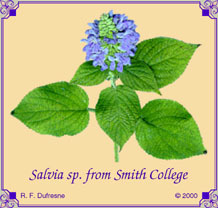 The plant is in bloom most of the growing season, and does well in sun and half-shade. This is one of the giant sages, growing as much as fifteen feet tall under ideal conditions. The flowers are amongst the largest of the genus. Since it is tender and a late bloomer, outdoor planting is best done in the warmest parts of the United States. It can be pruned and trained to become a nice greenhouse specimen. This selection is a form that has a dark calyx, which sets off the flower nicely. The foliage is richly aromatic, a little like S. dorisiana. Some of the plants being sold as S. fulgens may be forms of this species. Forsythia sage gets its name from the intensity of the floral display, which comes in the fall. All of the parts of the dense spikes are covered with yellow hairs. The flowers have a waxy texture. Most of the forms in the trade are hardy in central North Carolina, and one plant has persisted in Raleigh for at least seventeen years. Plant Delights sells this variety as `Dunham’. The plant can grow ten feet tall in one year. It tends to bloom shortly before frost, but usually helps finish the last four to three weeks of the growing season. It has strikingly quadrangularly ridged stems, which help to confer improved wind resistance. Other tall sages need more support, best provided with tomato rings to hold the cluster of rapidly growing stems. The form from Southwest Native Seeds develops leaves with a milky, silvery sheen in cool weather. A collection of Dennis Breedlove of Strybing Arboretum, this plant strikes me as a form of Salvia elegans. 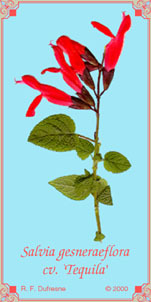 Its habit is to sprawl, and it has a scent and a late-blooming red tubular flower similar to that of the species. Hopefully, more information on this species will shortly be forthcoming from California. Another mystery sage, this is a historical accession of the greenhouse system at Smith College, perhaps from Dorcas Brigham. It is a tender late bloomer that would do very well in the warmer parts of this country. The inflorescence is a showy blue-lavender, primarily because of the density of the small flowers. It may belong to either sections Potiles or Polystachyae.